Below is a daily session planning document that you can use to plan activities according to areas of learning and EYFS statements. There is also an example session plan that has already been filled out, which you can use to show you one way of using this document. A planning document for you to print out and fill in with activity ideas. An filled in example of the above planning document, which shows you how the document can be used. The Chief Medical Officer recommends that under-fives capable of walking should be active for 180 minutes per day and unrestrained in movement whenever possible. Two early years factsheets are available to provide more information on the guidelines. You may be interested in our training and resources to support early years professionals with providing a healthy start. This course is ideal for anyone working in an early years setting who provides care to children from birth up to the age of five. Attending this 3.5 hour tutor led training will help early years practitioners develop a better understanding of the importance of early movement opportunities for the 0-5 age group and raise confidence to organise enabling environments for physical activity for the children in their care. The Early Movers course has been certified by the CPD Certification Service. This course can be hosted at a venue to suit you anywhere within the UK mainland. The cost of this course is £900. This price includes a 3½ hour tutor-led session, with practical elements, delivered by an experienced tutor as well as resources for all participants to take away. It can be run for a maximum of 30 participants but will require at least 10. The cost of venue hire, refreshments and local promotion are to be covered by the hosting organisation. Watch our short video case studies. People who have commissioned the course previously tell us why they wanted their staff to complete the course and what benefits they have seen in their settings. These leaflets provide parents with a wealth of ideas for getting their child (0–5 years) on the move right from the start. These come in a bundle of either 50 (£11.99) or 100 (£18.99) copies. The leaflets explain the benefits of kick-starting a love of activity from an early age and provide tips including ideas for getting more active in the house or garden, as well tips for reducing sedentary behaviour and how to encourage a child to be active who may not show much initial interest. The leaflets provide information about healthy eating and tips for tackling fussy eating and are perfect for Health Visitors or Nursery Practitioners to pass on to parents. 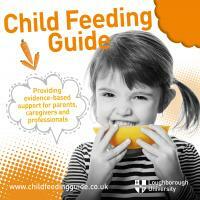 The child feeding guide gives access to effective, evidence-based tools and resources to help you to establish healthy eating habits in your children and create happy mealtimes. The early years foundation stage statutory framework sets the standards that school and childcare providers must meet for the learning, development and care of children from birth to 5. Physical development is included as a prime area for learning, one of three areas noted as particularly crucial for igniting children's curiosity and enthusiasm for learning, and for building their capacity to learn, form relationships and thrive.